For those out there that think China is a ‘friend’ and some kind of communist utopia with hot and cold running red unicorns, I give you the true face of Xi and China. Chinese officials arrested a government critic in the midst of a phone interview he was conducting with Voice of America, the U.S.-backed outlet announced Thursday. They don’t tolerate free speech the way we do. “While details about this incident are still not confirmed, VOA is monitoring the situation closely and will provide an update to program viewers once more information becomes available,” VOA spokeswoman Bridget Serchak said in a statement. The truth of the matter is that the professor doing the interview may never be seen again. This happened during a telephone interview where he gave his opinion on the Voice of America (VOA) Mandarin television show, Issues & Opinions. Professor Wenguang Sun was discussing “throw-money diplomacy,” a derisive term for the Chinese President Xi Jinping’s Belt and Road Initiative to expand regional influence through infrastructure loans to neighboring countries. He gave the interview just days after Secretary of State Mike Pompeo pledged that the U.S. government and American companies would offer alternative sources of infrastructure funding in the Indo-Pacific Region. The professor’s detention got immediate attention from U.S. officials. “Every time you hear overblown rhetoric about how we are on the verge of ‘tyranny’ or ‘authoritarianism’ in America remember what real tyranny & authoritarianism looks like,” Sen. Marco Rubio (R-FL) tweeted. “In China, the police arrested a Xi critic while he was in the middle of a live interview.” He will most likely be thrown in a pit of a prison and tortured to death. According to the Washington Examiner, Sun penned an open letter criticizing Xi’s plan to expand infrastructure spending in Africa, following the autocrat’s recent trip to the continent. “What? Did I say something wrong?” the professor could be heard saying when the police entered his house, according to VOA. “Did you hear I say anything wrong? So many Chinese are still poor, and we shouldn’t throw our money in Africa.” VOA believes he is under house arrest, but there is no way to know right now. “Subsequent efforts by VOA to re-engage with him for this interview have been unsuccessful,” Serchak said. 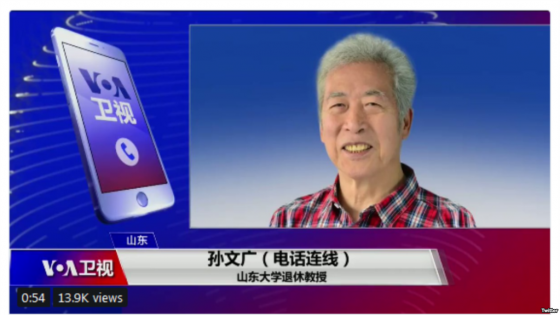 VOA Mandarin has attempted to reach professor Wenguang Sun by cellphone and WeChat, a popular social media platform, since he was removed from his home during the Wednesday night broadcast. The professor, who lives in Jinan, the capital of eastern China’s Shandong province, has not responded. Sources in Shandong told VOA he was under house arrest. “I am entitled to express my opinion. This is my freedom of speech,” were the professor’s last words heard on the show via telephone. Yibing Feng, VOA’s correspondent in Beijing, called the Information Department of the Ministry of Foreign Affairs of China for comment, but the mobile phone open to the public was turned off, and the landline was not answered. Feng also contacted the Public Security Department of Shandong University and the Shanda Road Police Station of Jinan’s Public Security Bureau. Neither would comment. This is the true face of communism and it is not pretty. This is where socialism leads every time… suppression of personal rights and expression. The only crime this retired Shandong University professor is guilty of is speaking his mind, which was just enough to get Xi’s secret police to brutally remove him from the public eye. His last words were, “At this moment, they are standing right at my door,” he said. “I am entitled to express my opinion. This is my freedom of speech!” Yes, it is, but the communist Chinese unfortunately don’t see it that way.